AMD (NYSE: AMD) today announced the widely anticipated launch of its 2nd-Generation AMD A-Series Accelerated Processing Units (APUs) for mainstream and ultrathin notebooks, All-in-One and traditional desktops, home theater PCs and embedded designs. AMD Radeon™ HD 7000 Series graphics for an increase of graphics performance up to 56% over the previous generation[iv]. Combined, the CPU and GPU cores deliver more than 700 gigaflops of computing performance[v] – several times more than the fastest x86 CPUs – to boost performance of hundreds of applications. Up to 12 hours of battery life through CPU and GPU power enhancements, with clear battery life leadership in notebook form factors. The developer ecosystem continues to gravitate to the unmatched level of compute and unique processing capabilities of the APU as more than 100 applications and games are now accelerated by AMD APUs. The 2nd-Generation AMD A-Series APU gives users superior Web-based video experience thanks to plug-ins for Google Chrome, Firefox and Internet Explorer 9 that make it easy for consumers to turn on AMD Steady Video technology. [vi] Recent applications that have been optimized for use on AMD A-Series APUs include Adobe Photoshop CS6, WinZip 16.5 and VLC Media Player. 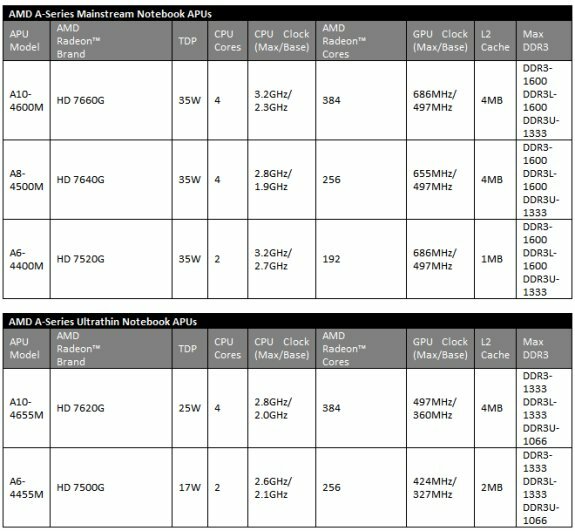 AMD A-Series APUs are also well-positioned to take advantage of the upcoming transition to the Windows® 8 operating system. For developers who want to engage in the industry’s move toward heterogeneous computing, the upcoming AMD Fusion12 Developer Summit will offer them a unique opportunity to enhance their knowledge base. More information on AFDS 12 can be found here. With more than 12 hours of ‘resting’ battery life, AMD is now an industry leader in notebook battery-life performance. The 2nd-Generation AMD A-Series APU delivers increased levels of performance, while consuming half the power as its predecessor. In ultrathin form factors, AMD enables an uncompromised visual experience thanks to a power-efficient and premium AMD Radeon™ graphics engine. Consumers can expect to see ultrathin notebooks based on the dual-core 17-watt and quad-core 25-watt AMD A-Series APUs. These products will be easily identifiable by aluminum-styled VISION Technology stickers at a range of competitive price points. True HD video chat with up to four people at once. AMD Video Converter – A video compression engine for fast conversion and sharing of media files across multiple formats and devices. Full decode support for H.264, MPEG-2, VC-1, MVC, DivX and WMV. Performance-leading DirectX® 11 graphics architecture and 1080p gaming a life-like level of detail. AMD Radeon™ dual graphics support that delivers a performance boost of up to 75 percent when adding a discrete graphics card to the APU. [xi] The AMD Radeon™ dual graphics option also offers support for DirectX® 9 for older game titles, and uses new AMD CrossFire™ Technology Profiles for easier updates. AMD has a record number of design wins with companies like Acer, Asus, HP, Lenovo, Samsung, Sony and Toshiba based on our 2nd-Generation AMD A-Series APUs and VISION Technology from AMD, with mainstream and ultrathin notebooks, as well as embedded solutions, available beginning today.